I am starting my first post with one of my obsessions – homemade chicken stock. 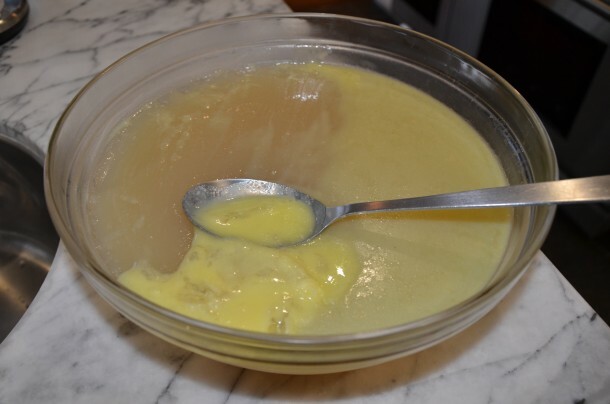 Since chicken stock is something I use quite regularly, especially during soup season, I thought it would be a good idea to get a recipe out there right off the bat. A chicken stock made from scratch is heads and shoulders above anything you can buy in a box or (worse) a can. Not only is the taste superior when you make it yourself, but it is so much more healthful, too. When the kids go back to school and the weather turns colder, it is very important to nourish ourselves with foods that boost the immune system. 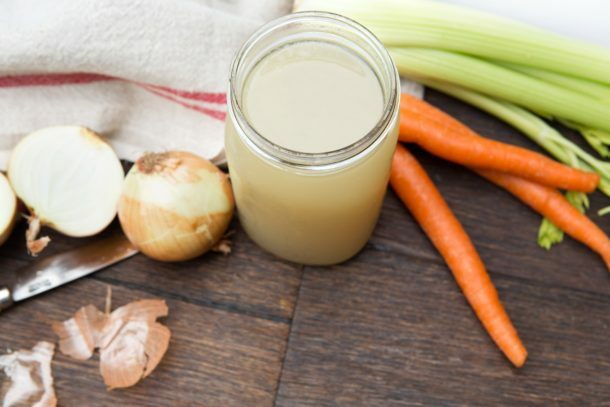 Prepared properly, chicken stock is rich in minerals, aids in digestion, and strengthens the immune system. Making stock does not require a lot of work, but it does take some time on the stove to simmer. I like to make stock on a day when I know I’ll be around for 5 hours or so and I usually make 2 large stockpots at once. Stock can stay in the refrigerator for 3-5 days or be frozen for up to 3 months. Just so you know, I’m all about efficiency, and this is the first of many opportunities to apply “green” principles — which can save you some green. Let’s say you just made a flavorful roast chicken last night – instead of tossing the carcass in the garbage (this is a simple example of adaptive reuse! 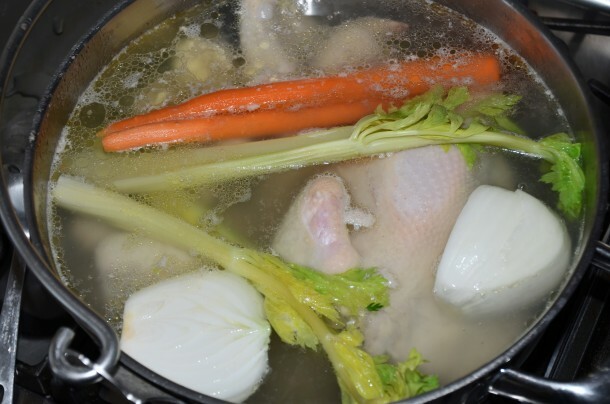 ), save it for chicken stock, it will yield a very rich broth. That way you get multiple meals from a single purchase, saving you time and money. Who said it wasn’t easy to be green? Bones! Use fresh chicken parts such as backs, necks, wings and feet, if you can get them. (Toss the feet in the pot first so they don’t float to the top and stick out. That really freaked me out the first time I did that!) You can also use a whole chicken if you like to have poached chicken meat to use afterwards. Cold water – it will draw lots of flavor from the bones. A gentle simmer – this will result in a clear broth. A little acidity (such as vinegar) – to draw lots of minerals and amino acids from the bones. Time – the longer it simmers, the more flavor you will have. Turkey, too – you can do the same thing with your leftover turkey carcass from Thanksgiving. Let me just warn you right now – once you’ve cooked with homemade stock, you’ll never go back to a box! Wash the chicken and remove gizzards from the cavity. 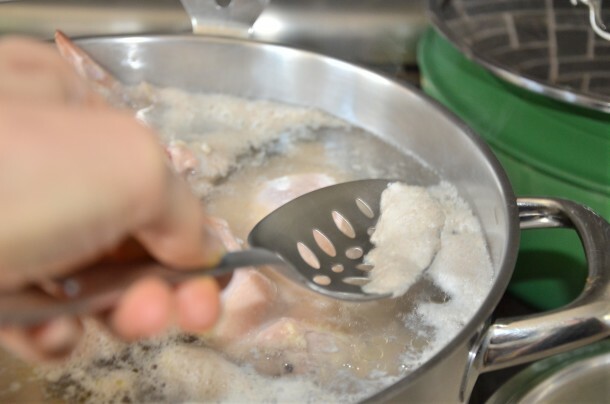 Place chicken and/or chicken parts in a large stainless steel stock pot. (You can cut the chicken into pieces if you need to in order to fit in the pot.) Add the cold water and vinegar. Put the temperature on high and bring to a boil. Immediately turn heat to low and skim with a slotted spoon any foam that rises to the surface. Try not to skim any of the fat or you will lose a bit of flavor. At this point, it is important to keep the stock to a bare simmer and NOT a boil. After skimming off all the foam, add all the vegetables except the parsley. Cook uncovered at the gentlest possible simmer for 4 to 5 hours. (I like to go as long as 12 hours. ( You want to see tiny bublles just barely breaking the surface. If the heat from the burner does not go low enough , partially cover the pot or leave your stock pot half on the heat and half off. About 10 minutes before finishing the stock, add the sea salt and parsley (this will impart additional mineral ions to the broth). 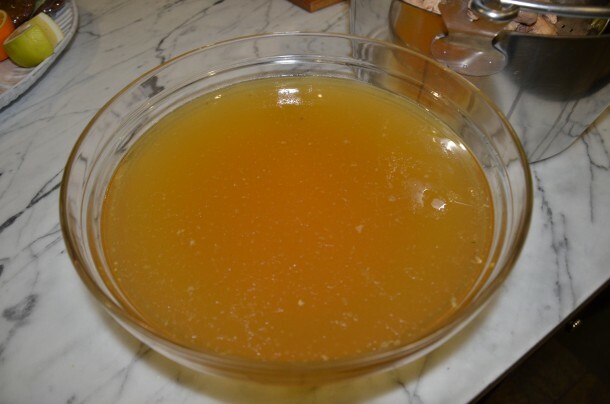 Strain the stock into a large glass bowl. Remove the chicken meat from the carcass, if using a whole chicken, and discard the remaining solids. Cool before refrigerating. Ladle through a fine mesh sieve into quart-sized containers or whatever size is most useful and refrigerate overnight. The next day, skim off the congealed fat at the top of each container. Refrigerate the stock for up to 5 days or freeze for up to 3 months. I have been using BPA-free containers from letsgogreen.biz as well as Sistema. I also reuse glass quart-size jars from yogurt and Vegenaise. Just soak the labels off and wash before adding your stock. *Cold water draws the flavor out of the meat and bones. **Acidic wine or vinegar adding during cooking helps to draw minerals, particularly calcium, magnesium and potassium, into the broth. Hi- I just made stock and am waiting for it to cool in a large glass bowl. Should I cover the bowl when I put it in the fridge? You can, but sometimes I leave it uncovered. It’s probably safer to cover it so nothing falls into it or so it doesn’t spill if people go through the fridge. I was wondering what brand and size pot do you use to make the stock? Love your recipes! Can you use a rotisserie chicken carcass after the meat has been consumed? Absolutely! You’ll need a few of them though or you’ll at least need to supplement the carcass with additional chicken parts. Just make sure you clean any flavorings out of the cavity, such as herbs or lemon. Ahhh great! So if I put raw breast/ribs how long should they simmer before I remove the meat is I want to eat it? i am interested in making homemade stock but i’d like to be able to do it in a crockpot. have you tried that yet and do you have suggestions on how to alter this recipe for a crockpot? also above you mention using the bones from the night before’s roast chicken. can i do this recipe with just the carcass or do i need to add fresh chicken parts as well? Hi Debra, I’m sorry this wasn’t a success for you, but you can just strain what is left and use it for stock. I can think of two possible things that would have caused this to happen. First, it’s important to very gently simmer the stock, as in tiny bubbles barely breaking the surface. Boiling is not what we want here. Also, salt should not be added until the end, if at all. Salt causes rapid evaporation. If you happen to use kosher chicken, I think it might be better to partially cover the pot. Let me know if you have any other questions and I am happy to help. What about using the vegetable scraps that I usually use to make my vegetable broth with for the chicken stock? Seems like they would work as well? Definitely! Good call. Actually brown onion skins will add a nice golden color to the stock. Pamela, what do you do with the cooked vegetables from the stock? Use them as compost? I have been cooking my own stock since I can remember, but first I would boil it and then simmer it – it never turned out nice and clear! So live and learn! the gentlest simmer is key to a clear broth. You can also strain the stock through cheesecloth for a super clean stock, but I think a fine mesh sieve is perfectly good. Usually I throw the vegetables out since there’s not much left to them after they’ve been cooked for so long. They’re a bit oily from the stock and they have come into contact with animal products, so I don’t compost them. Hope that helps! either is totally fine. the vinegar does not add flavor, it’s merely to pull extra minerals out of the bones. 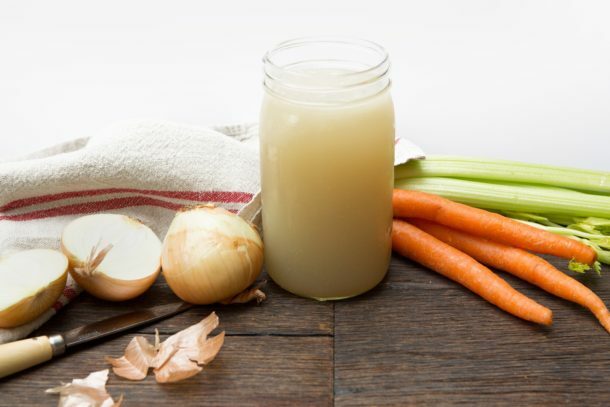 in fact, you don’t need vinegar to make a good broth, it just makes it a little more nutritious. 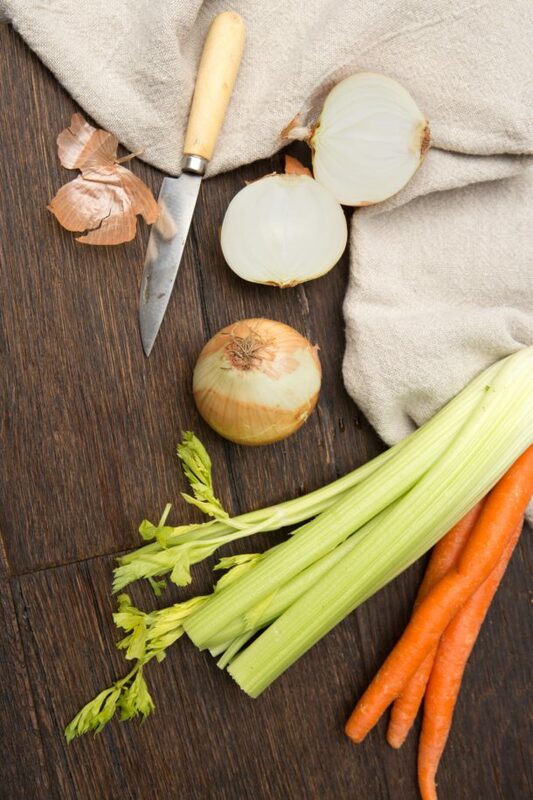 so excited you’re going to make stock from scratch — it makes a world of difference in taste as well as nutrition! I’m doing it Pamela! The whole chicken is in the oven (a little early) and I plan on making stock. Are the gizzards trash or should they be cooking and just outside the cavity? That’s awesome, Jen! Some people use the giblets for stock or gravy, but it’s not my thing so I hate to admit it, but I toss them in the garbage. Pamela, where do you purchase these nifty quart-size storage containers in which to freeze your delicious stock? Many thanks! I bought the quart-size containers at Smart & Final. You can store your stock in anything, really. I’m on the lookout for BPA-free containers — I’ll let you know if I find anything. This was so delicious!!! Yes, by far the best chicken soup I’ve had! I actually prepped my nanny on how to make it (since it takes several hours) and she totally nailed it! Looking forward to making it myself next time! Thx for this great recipe!! I’m on a mission to get everyone to make homemade chicken stock! I’m so glad you agree that it is the best! We have made this chicken stock twice. It is so easy to make and turns out delicious. We have made soups with it and it is so yummy. It is also easy to freeze and keep it for whenever you want it. Thanks for the great recipe! Question: if using a whole chicken for the broth, what will the poached meat be good for? Will it be dry/tough after 5 hours of cooking? Thanks! Good question! The chicken meat will be soft and moist after cooking in liquid for all that time. In fact, my kids will start sneaking it while it’s cooling in a bowl on the counter. Normally I use a whole chicken if I have a plan for the meat. I have used it in chicken salad, shredded into soup for a classic chicken soup, pot pie, shredded with my taco seasoning, for enchiladas or burritos. I added chicken, bok choy and star pasta and my kids and husband LOVED this soup. My five year old even asked for it in her thermos for school. So delicious and so easy!! This is a very easy recipe. I never thought I would be making my own homemade stock and now I can’t imagine buying a commercial brand! Thanks for all your advice to keep us healthy! You were my first chicken stock, attempt ever, Pamela, and it was delicious and easy. I always have some on hand and split up the portions to use for different soups or as is! You’ll never go back to a box, Laurey!